Shingle Belting's truly endless TrenCore tube-winder belts are designed with many years of application experience and manufactured on state-of-the art equipment. Shingle TrenCore belts are constructed with high tensile spiral cords, nylon stabilizing layers, and specially designed rubber and thermoplastic covers for use on core winding equipment in the spiral tube industry. The rubber is available in black, white, and custom colors and can be provided with a smooth or buffed finish. 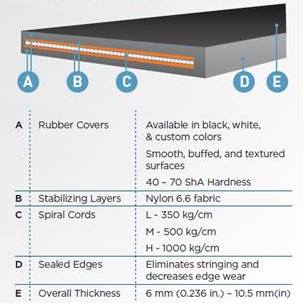 Specially compounded TrenCore rubber and thermoplastic covers are designed for maximum abrasion resistance and uniform pull throughout the belt's life. Manufactured truly endless, TrenCore belts have no splice that can fail. High-tensile strength members are pre-tensioned, resulting in less stretch than the competition's belts. The top and bottom covers of TrenCore belting can be used to double the belt's life. 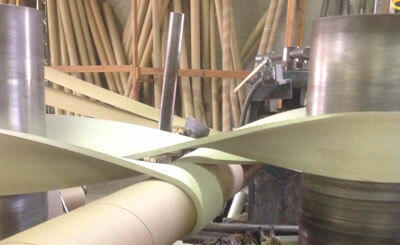 Both edges are sealed which eliminates belt stringing and decreases edge abrasion. Designed to work with a wide variety of paper types.